From about 1870 with the change in the Dutch economy, there was a huge increase in building work, especially the construction of luxury villas and hotels. On 20 November 1880 the N.V. Harlem – Zandvoort Spoorwegmaatschappij was brought into being. By 10 December 1880 work had already begun on the railway line from Haarlem via the Schoterveenpolder to Overveen and through the dunes to Bad Zandvoort. 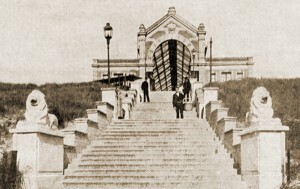 The official opening of the railway line, Passage and Kurhaus took place on 2 June 1881. The Passage in Zandvoort was built from a design by J.C. van Wijk. 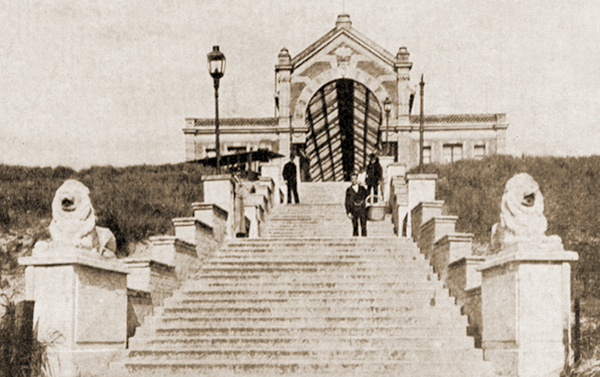 It was an imposing structure that formed a link between the lower-lying station and the Kurhaus. The visitor reached the entrance by means of a huge staircase which was embellished on both sides with sculpted lions. This entrance contained a high round arch on which the Zandvoort coat of arms was placed. Once through the entrance the visitor encountered the lengthy Passage itself, two storeys high and covered over with a glass saddle-roof. Here people could feel at home, sheltered from the wind and the weather. Soon, there appeared little restaurants, cafes and lunchrooms, along with about twenty shops into which chocolate, cigar and wine establishments tried to lure customers with their shiny enamelled sign boards. 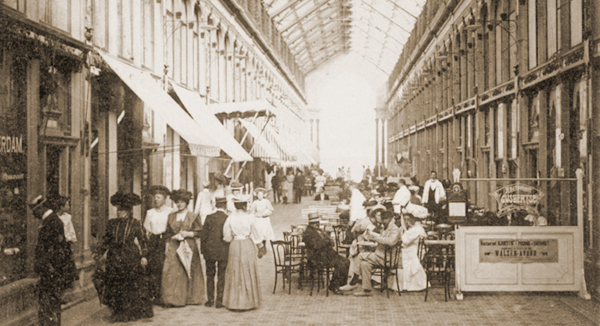 The Passage also housed exhibitions, and orchestras regularly gave afternoon and evening concerts. During the winter close season the Passage served as a put-up for the bathing coaches. When the rail terminus was moved to the north side of the village in 1907, the Passage lost its commercial significance, and the shops gradually disappeared. Poor families who could find shelter nowhere else moved into the uninhabited spaces. This special building was destroyed by a fierce fire during the night of 3rd – 4th March 1925.